Few gaming franchises have stood the test of time like Street Fighter. The series built the one-on-one fighting game genre from the ground up and has remained a top player as the genre has grown to meteoric heights. 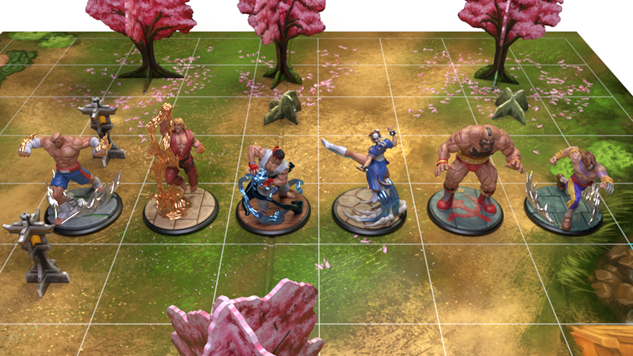 Now, the strategic action of those 2D-plane clashes is making its way to a 3D battlefield housed wherever one can set up a game board with Jasco Games’ Street Fighter: The Miniatures Game. Co-designed by Joe Vargas of “The Angry Joe Show” fame, the game features gridded boards inspired by classic Street Fighter stages, littered with the same 3D destructible crates and trees found in the videogames, where “collector-sized” miniatures of classic Street Fighter characters spar in multiple battle modes using cards and battle dice. The miniatures look very well-crafted and feature eight iconic characters from the series: Ryu, Chun-Li, Ken, Sagat, Zangief, Vega, Akuma and M. Bison. Players can go head-to-head in the classic one-on-one matchup but will also be able to fight two-on two, three-on-three or in a six player free-for-all. Boss battles are also included in the game, allowing three fighters to take on a massively powered M. Bison or Akuma in a climactic battle. The game has already met its goal on Kickstarter, but it still has plenty of stretch goals that could be met, including additional fighters, decks and game modes. We’re still hoping they add a playable Skullomania, but the game looks beyond rad in both its detail and accessibility. It appears to be the perfect tabletop tag team partner to the long-running franchise. The game doesn’t have a release date yet, but pledge awards are due for delivery in March 2019.